Carl E. Smith, 85, of Huntington, IN, died Sunday, Jan. 13, 2019, at 3 p.m. at his home. Mr. Smith graduated from Huntington High School in 1952 and served in the United States Army during the Korean War. He was the former owner of Smith’s Garage for 13 years. 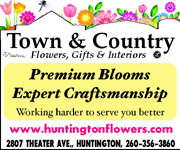 He served the City of Huntington as a police officer for 20 years. He worked for 16 years with Indiana State Revenue and served as Huntington County auditor for four years. He was a member of the Church of the Brethren, as well as American Legion Post 7, VFW Post 2689 and the Fraternal Order of Police. 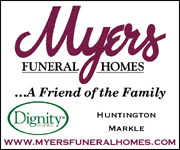 He was a 50-year member of Amity Lodge 4483 and a member of Mizpah Shriners Temple, the Scottish Rite of Fort Wayne, Little 500 Racing Shriners, York Rite of Indiana and the Khyber Green Club. He was born March 25, 1933, in Huntington to Alvin D. and Marie V. Soper Smith. He married Barbara A. Harrell on Nov. 3, 1953, and she survives. Additional survivors a son, Wayne E. (Theresa) Smith, of Huntington; two daughters, Pamela (Thomas) Holzinger, of Roanoke, and Karen (Steven) Fairchild, of Columbia City; two brothers, Jack A. Smith and Larry W. Smith; a sister, Sharon Turner; nine grandchildren; and a great-grandchild. 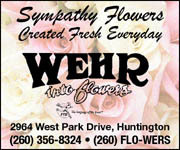 Memorials are to VFW Post 2689, in care of Bailey-Love Mortuary, 35 W. Park Drive, Huntington, IN 46750.